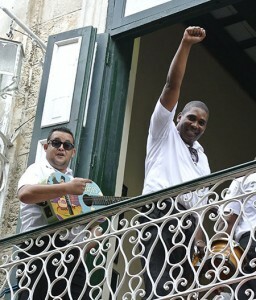 Two Musicians on a balcony in Cuba. Hurricanes, our tour guide Mercedes was explaining, are certainly a concern for the island nation of Cuba—but, in fact, named storms are often welcomed. Despite the potential damage, they bring much-needed precipitation to the dry Caribbean island, helping to irrigate the farm fields so crucial to the country’s economy. A tiny fact, but one that seemed more and more compelling as a metaphor for what we found on a visit in early November as part of a journalistic mission to Cuba. Organized through the New York Press Association, the adventure sent community journalists from throughout the state to experience Cuba at a time when a storm of change is brewing just 90 miles away. The Press attended, as did members of The Sag Harbor Express and some two dozen other publishers, editors and photographers from daily and weekly newspapers in New York State. The NYPA trip had been sanctioned by federal officials who clearly want to nudge along the thawing of relations between the two countries. The trip was bookended by the October 28 vote by the United Nations to condemn the U.S. embargo of Cuba—a vote of 191-2, with only the United States and Israel voting no. On our return, the headlines reported that a plan to close the U.S. prison in Guantanamo Bay, long a source of friction between the two nations, was expected to move forward swiftly. Change is rolling forward with great momentum, and seems to be gathering speed: Even in Cuba, most everyone spoke openly about the pending normalization of relations between the two countries, longtime enemies. At least the governments have been—one thing I discovered is that the Cuban people, seemingly without exception, harbor no ill will whatsoever toward American visitors for the impact of the half-century-long embargo. They were, uniformly, thrilled to see us, eager to talk with us and ready to welcome more of us. Some of it was clearly self-preservation: the money that would accompany American tourism, along with an end to the trade embargo, has the potential to change lives. But there was a sincere fellowship as well: Cubans, we were told over and over again, have friends and family in America, and so the connection is a personal one already, despite the many attempts to block it. I hesitated to write about the trip because what can I really offer? I spent a week in Cuba, mostly on a peninsula loaded with international resort hotels, and a town, Varadero, that is largely driven by tourism. Two days were spent in the beautiful city of Havana, wandering its streets as tourists do in any other major city. We interacted with many Cubans, who were unfailingly friendly and willing to talk. But it’s fair to say that a week as a sanctioned visitor offers only a tiny glimpse at what people kept calling “the real Cuba”. That’s partly by design: One striking discovery is just how much the government of Cuba has effectively changed the way people think, so that oppression can fade to the background where it lurks as an existential threat. You don’t have to threaten people, after all, when the very thought of crossing certain boundaries has been slowly eroded by 50 years of censorship. Take, for example, the conversation we had with a 25-year-old Cuban journalist. She reminded me very much of a Press reporter: young, eager, talented, smart. Her full-time job at a government-owned newspaper—a gig that is part of her mandatory service required of all Cuban citizens—pays her the equivalent of $30 a month, a figure I repeatedly heard as an average salary for all kinds of workers, including doctors, nurses, professionals of all stripes. She also freelances for an independent magazine published by a man in Miami, Florida and distributed throughout Cuba; she makes as much writing two articles for the magazine as she does in a month at the newspaper. She was candid, to a point. But it quickly became clear that “journalist” in Cuba is a very different job. Did she fear being jailed for her writing, as other journalists have been in a country that the Committee to Protect Journalists calls “the most restricted climate for press freedom in the Americas”? No, she replied, not really. She would be more worried about losing her job; she mentioned that a colleague suggested she begin using an assumed name for her independent work. Does she rock the boat in her magazine work? A blank look was the reply. It wouldn’t really occur to her to be critical of the government—an effective demonstration of how censorship becomes self-censorship over time. We mused that taking on the government was a perk to the job in America, the fun part. “But do you really think it brings about any change?” she asked with a touch of incredulity. When we replied that we certainly believe our work has an impact, you could see a tiny flame flicker in her eyes. It was a new concept to her. It’s crucial that those tiny flames are fanned. Cuba is one of the most literate, educated countries on the planet, the result of a socialist system that has emphasized education, but the people have been isolated for so long. The Internet remains a fleeting glimpse of the world for most. Cubans are smart, but they are largely uninformed. It’s up to young journalists, like the one we met, to change that, in a climate where the free press has been brutally silenced for decades. The bigger lesson was economic. Cuba hums with construction: swanky new hotels in the tourist areas, condos in other places, infrastructure elsewhere. Canadian and European tourists are crucial, but they won’t hold a candle to the invasion of American tourists if the embargo is lifted. Cuba wants to be ready—but it very clearly is not. Cruise ships and airliners will dump visitors in like locusts. They will bring money, but they will demand services at a rate no country can provide. Will the new money reach “the real Cuba”, where even doctors compete for coveted spots waiting tables at the resorts to support their $30-a-month stipend? The need is immense, as most working Cubans live in near poverty, and only the black market is available to anyone with entrepreneurial skills. Perhaps, if the changes continue, “the real Cuba” will reap the rewards, more freedom will be demanded and capitalism will win another round. But it was clear from our visit that the future is far from certain. On our last night, a storm was well offshore, throwing brilliant cloud-to-cloud lightning and darkening the horizon. It was coming in fast, bringing plenty of refreshing rain to help things grow. But who knows what else it would bring.